The album opens with the band’s semi-political brand new single ‘I Hope That I’m Wrong’ – in the words of lead singer and songwriter Bryan: “I wrote this song around October 2017. It was about 9 o’clock in the morning, and I walked down the stairs and into the kitchen and I sat down and read the newspaper. The song started playing in my head and it was as though every headline I read triggered a new line or a new verse. I guess it was around the time that the #MeToo movement started, and as soon as I wrote the opening words “Women, do what you must/There’s not a man in the world you can trust” I knew that I wanted that to be the first line anybody hears on the new album (which we were already half way through recording). The song came together so quickly in my head – it was fully formed within minutes, and when I picked up my girlfriend’s guitar which was leaning on the kitchen table, I was already in the right key and could play it from beginning to end. There are songs on this album that I laboured over for months – years in one case – but ‘I Hope that I’m Wrong’ was the opposite. If someone had told me I would one day come up with a song that discussed climate change, greed, poverty and sexual harassment I’d have told them they had me mistaken for somebody else. But I guess that’s what this is, and it took about as long to write as it does to sing. Lachlan Bryan and The Wildes have built their reputation on storytelling. Over the past eight years they have released four records, toured Europe and the USA multiple times, shared stages with Americana and country heavyweights and picked up a string of awards, including the Golden Guitar for ‘alt country album of the year’ with their landmark release ‘Black Coffee’. Since emerging in 2009, Lachlan Bryan and The Wildes have become known as the finest Australian exponents of Americana Music, winning the prestigious Golden Guitar Award for Alt-Country Album of the Year in 2014 and being finalists again in the category in 2016 (Lachlan returned to the awards to present the very same award to Kasey Chambers in 2018). At home they have played the main stage at every major country and roots festival, as well as supporting international acts such as Steve Earle, Joan Armatrading, Shawn Colvin and John Hiatt in theatres across the country. Lachlan and band have also toured the USA several times and made their first visit to Europe in 2017, where they performed shows in Switzerland, Germany and The UK (where the band was a highlight of the iconic Maverick Festival). 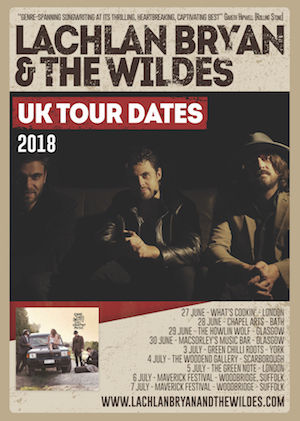 Whether appearing as a stripped-back roots three piece or in their full five piece formation, Lachlan Bryan and the Wildes are always an engaging live act. The stories are universal and their authenticity is palpable.